Social media sites were inundated with ‘Go Novak’ or ‘Vamos Rafa’ messages. Many of you last night would have decided to head into work on Monday morning sleep deprived rather than miss out on one of the greatest sporting spectacles of all time. Is that a far-fetched comment? No it is not. Last night’s final was contested by, currently, the two greatest players on the planet. They had already created history before the first serve by being the first finalists to meet in three consecutive Grand Slam finals. By the end of the match, they had created another three records. 1) The longest men’s singles final in the Open era. 2) The longest match ever at the Australian Open and 3) The first player (Nadal) to lose three consecutive major finals. Nadal took the opening set, 7-5, after an hour and twenty minutes – longer than the entire women’s final during the previous evening. Cue the statistics – Nadal had never lost a Grand Slam final after winning the opening set. In the second set, Djokovic responded by breaking Nadal’s serve early on and raced into a 4-1 lead. Uncle Toni looked nervous as the Serb’s ground strokes were pushing Nadal to an average of 2-3 metres behind the baseline. That said, Nadal fought valiantly to save three sets points but it was not to be as Djokovic claimed the second set 6-4. Into the third set and again, Djokovic struck early and stomped all over Nadal to win 6-2. The world number one was dominating but Rafa has the experience of winning 10 majors. He was never going to make it easy for the Serb, which was evident as he pulled out a booming 100 mph forehand at 3-4 to tie the fourth set at 4-4. Cue the rain and the game was temporarily suspended as the roof was closed. Minutes later and the gladiators were at it again – the fourth set would be decided by a tie break. More unbelievable tennis culminating in Rafa dropping to his knees, fist pumping in a wild celebration as he levelled the match. The momentum had shifted once more. As the game approached the five-hour mark, more statistics. How tight was this match thus far? Total points – 167 versus 157 in Djokovic’s favour. After five hours only 10 points were separating these immense athletes. Then Nadal broke serve, 4-2. Incredible. The sporting world assumed at 1am that would be it. ‘All he has to do now is hold serve’ but then at 30:15 (Nadal), Rafa made space and pushed a backhand out wide which sparked life into Djokovic who then broke Nadal and held serve to make the fifth set 4-4. Gasps. Both players went on to hold serve once more (5-5) and then in the 11th game Rafa played some incredible defensive tennis to keep Djokovic at bay, but the Serb was relentless and found a way through to take a break point, making it 6-5. Rafa again, fought like lion, deflecting Djokovic’s best efforts until seven minutes shy of six hours, the World Number 1 could not be denied and added a third Australian Open title and fifth major title to his trophy cabinet. This was a great tennis spectacle, if not the greatest. The two performances were out of this world and it was as if the two players had been teleported back in time to ancient Rome at the Colosseum, fighting for their lives. Quite fittingly at the end of the match, during the presentations, both players were slouched on their chairs, emotionless and utterly exhausted. Neither player seemed wildly happy or overly disappointed. Both men though were well aware that they had played a significant part in something special. Rafa did manage an opening, tongue in cheek, line of ‘Good morning!’ when addressing the crowd at 2am. Djokovic responded “I’m playing against one of the greatest players ever. The player that is so mentally strong, and he always comes up with his best game and best shots at the right moments. The last fortnight as a whole has been fantastic. I cannot think of a better Grand Slam tournament. The players have entertained and gripped sports fans around the globe with their heroic and dramatic performances. The games have progressively got better and as an audience, we believed that they had peaked at the semi-final stage as Andy Murray delivered a much improved performance to push Djokovic right to the wire, whilst Rafael Nadal edged out the great Roger Federer ending his quest for a 17th major. Make no mistake, this is a great era of men’s tennis. Historically, there have always been ‘great’ players but we are lucky to have four who consistently bring the best out of each other. This article’s title originates from a book written by George Kimball about Sugar Ray Leonard, Marvelous Marvin Hagler, Thomas Hearns and Roberto Duran – the last great era of boxing. In the 1980s boxing was in a sorry state and it was rescued by these four athletes. Between them they would fight each other nine times and would win sixteen world titles between them. Now tennis was a comfortable distance from a sorry state before the likes of Djokovic, Nadal and Murray evolved but it was a sport being totally dominated by Roger Federer. These four players are now pushing each other to new boundaries. When people talk about Leonard, Hagler, Hearns and Duran, they often talk about ‘the best fights of all time’. After last night, people will be talking about the best tennis match of all time. We are very fortunate and privileged to be watching these tennis players in our lifetime. Andy Murray, without any majors to his name has been a finalist three times and without doubt will benefit from having Ivan Lendl as a coach. Good times can only be around the corner. Roger Federer, widely considered the best of all time due to his 16 major victories, has not won a Grand Slam tournament since 2010 but his defeat to Nadal was his first since August last year. Rafael Nadal will be hurting that he lost to Djokovic again but this time he pushed him to the absolute limit and on another day, he would have made that backhand and held serve to move 5-2 up in the deciding set (the butterfly effect). Then there’s Djokovic. 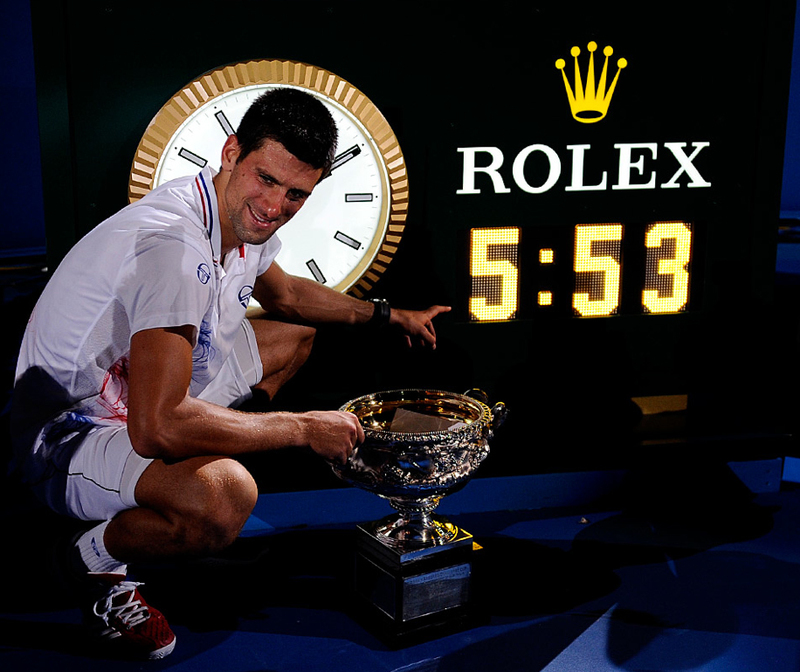 Winner of four of the last five Grand Slam tournaments. He hadn’t picked up a racket competitively this year until his first round match two weeks ago. He now has beaten Nadal in their last seven finals (three Grand Slam finals), who in turn has beaten Federer eight times in their ten head to head matches in Grand Slams. Looking ahead, Djokovic has the opportunity to be immortalised by winning the Grand Slam (current champion for all four majors) if he triumphs at Roland Garros. This is undoubtedly a hard enough challenge in its own right but with the King of Clay standing in his way, the odds are stacked against the Serb. The Grand Slam is a feat which has not been achieved since Rod Laver in 1969. For now though Djokovic can take a step back and appreciate his most recent achievement, safe in the knowledge that he has already played a significant part in what is possibly tennis’ greatest ever era. Love the George Kimball reference, but I don’t think Andy Murray qualifies as until he wins a major. To follow through on your anology of comparing current tennis players to the Four Kings of 1980’s boxing: Federer has to be Duran because he peaked much earlier than his peers and is the most likely to put on 30kg after his retirement from the sport. Murray is Hagler by virtue that he would have been an all time great had he been born in any other era. Rafa is Sugar Ray because he was over-hyped as the next best thing from such a young age, and Djokovic is Hearns by virtue that he has the undisputed shittiest haircut out of all the others.